The one day soccer tourney will take place on Thursday 29 March at the CIFA complex in Matavera where ten primary schools on Rarotonga will gather to play fun football. With the assistance of CITC Coca-Cola this year, the competition will be called the “Coca-Cola Primary School One Day Soccer Tournament” respectively. Those schools vying for top honours are Papaaroa, Te Uki Ou, Avarua, Takitumu, Avatea, Imanuela Akatemia, St Joseph, Rutaki, Arorangi and Nikao. The sponsorship will drive the development of soccer and will assist this event which is held once a year. Mr. George George, a representative of CITC Coca-Cola, has emphasized that the sponsorship of this one day soccer tournament shows the commitment of the company in supporting junior development in the game of soccer. 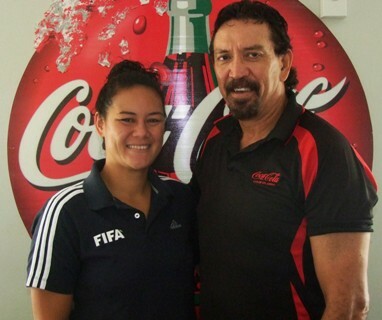 “On behalf of CITC Coca-Cola we are always pleased to support junior development programs here on Rarotonga and in the game of soccer,” says George. According to Mii Piri, Secretary of Cook Islands Football Association welcomes the support from CITC Coca-Cola for this tournament and their continuous support in the development of soccer in our juniors and youth is very much appreciated. The Primary School Soccer Tournament has been running for over six years now and proves to be popular amongst the children who participate in the one day tourney and no doubt FUN football will be played on the day.